Kaitlyn writes……….. Every Labor Day weekend the population of the quaint little Heber Valley that I call home nearly doubles or triples in size. This mass influx of people is due to a wildly popular festival called Swiss Days that takes place in Midway, Utah. 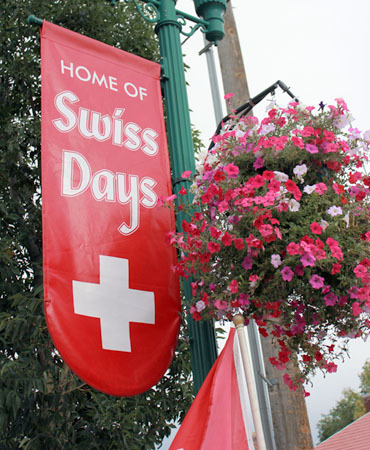 I had actually never heard of it before I moved here, but Jillee told me that her family used to come up to Midway from California every year just to go to Swiss Days! Back in 2012, Jillee did a post documenting some of the fantastic crafters that sell every kind of homemade item you can imagine at the festival. Although the craft booths and cultural events are a huge part of Swiss Days, one of the biggest draws is the food. And for MANY people it’s all about the scones. I’m sure when you hear the word “scone” you think of the crumbly, biscuit variety that can be tricky to make. But in Utah we do scones differently. Utah scones are more like Navajo fry bread or Sopapillas….perfectly fried pieces of light and airy dough topped with butter and honey or turned into a “Swiss taco.” Nobody really seems to know how these came to be called scones in Utah, and I’m pretty sure you wouldn’t be able to find a Swiss Taco anywhere in Switzerland. ;) But regardless, people come from far and wide for this tasty treat. Since most of you probably won’t be able to make it to Midway this weekend to try one for yourself, today I’m sharing a simple recipe so you can make them at home! I promise you won’t be disappointed! Start by heating your oil. I have this fantastic little fryer that I found on Amazon. (Click here if you’re in the market for one.) I very rarely deep fry anything at home – in fact this is only the second time I’ve used it since Christmas. But it’s super convenient for times like this. My fryer recommends an oil temperature of 375 degrees for pastries. If you’re using a stock pot for frying you can measure the temperature with a food thermometer or test it with a small piece of dough. When you drop dough into the oil it should sizzle and float right to the surface. Mix the dried milk and warm water together in a small bowl. Mix the flour, salt and baking powder together in a large bowl or the bowl of a stand mixer. I used my Kitchenaid mixer with the paddle attachment but I think you could do this in a bowl with a hand mixer as well. Turn your mixer on a low-medium setting and slowly add the milk mixture until everything is well incorporated. Put golf ball-sized piece of dough (depending on how big you want your scones) on a cutting board sprinkled with flour. Roll the dough out into a large oval until it’s about 1/4 inch thick. Don’t worry about getting a perfect circle or if the dough tears a bit! These scones are meant to look rustic and imperfect. Cut three slits in the dough to prevent air pockets forming while frying. …a scone with a big 0l’ bubble in the middle that didn’t cook evenly. You can fry your scones one or two at a time depending on the size of your fryer or pot. I decided to stick to one at a time. Fry them until they are golden brown on both sides then drain on paper towels. I actually overcooked a few of mine and they still tasted fine. They are hard to mess up! I am dying to try these scones with some of Jillee’s Homemade Honey Butter Ambrosia but I didn’t have any on hand. So I topped them with butter and plenty of honey. You can reheat them but they definitely taste the best right out of the fryer! Another one of my favorite ways to eat Utah scones is Navajo Taco Style – pile them up with ground beef, refried beans, lettuce, cheese and plenty of fresh salsa. Yum! How do you do scones in your house? Mix the flour, salt and baking powder together in a large bowl or the bowl of a stand mixer. Turn your mixer on a low-medium setting and slowly add the milk mixture until everything is well incorporated. Put a golf ball-sized piece of dough (depending on how big you want your scones) on a cutting board sprinkled with flour. Roll the dough out into a large oval until it's about an 1/8th of an inch thick. Fry your dough until golden brown on both sides then drain on paper towels. Thank you for the great recipe! My son wanted me to run to Wal-Mart, spend his birthday gift card on a deep fryer and make these. We just did and love them-sprinkled in cinnamon sugar. Now we are looking for other varieties of the batter. Has anyone tried making these with a gluten – free flour mix? If so, how did they turn out? for professionals to protect themselves on this dangerous job. the towers affiliated with your insurers and arrange it yourself. them into clicking the dreaded Back button on their browser. Have you tried a gluten Free version yet? Hands down one of my favorite parts about living in Utah. And that Navajo taco just can’t be beat. YUM! Thank you. As a child, my grandfather took me fishing at Fish Lake in central Utah and in a diner in Koosharum (spelling ?) I had scones. When I returned to Las Vegas, every scone I ordered was never the same. When I discovered beignets, I was closer. Thank you to I think I have found my childhood treat! The reason the recipe includes powdered milk is because this dough originally came from the reservations and the Native American women who made the bread had to use what was available to them and fresh milk was hard to come by. I used to buy these every year at the Texas State Fair (called funnel cakes, because they thin the batter and drop it through a funnel into the fat), along with freshly dipped and fried corny dogs. Now that I’m allergic to wheat and corn, I miss them terribly! Wonder if a wheat-free flour would work … hmmm. I love fry bread! My favorite way to eat it is filled with chili.